Note: If the person's name isn't underlined, there is no link to a memorial page, if it is, click on the link and learn more about the person. Joseph L. Jones - grandfather of Norine Jones Allen - our great grandfather. Born in Georgia. Buried in Coal Creek (Furr) (Creek Mine) Cemetery near Henryetta, OK.
1. Cordellia Elizabeth "Lizzie" Jones McLeland (DOB 1865 - DOD 1947), wife of Isaac "Ike" W. McLeland DOB 1863 - DOD 1936. Buried in Coal Creek Cemetery, Henryetta, OK. This cemetery is also know as Furr Cemetery and Creek Mine Cemetery. She had a son David William McLeland who is buried in Okmulgee Cemetery, Okmulgee, OK. At the present time he has no marker. One of the employees of the cemetery said he was buried in the very south part of the cemetery in Lot 667 of Section X. 2. James (Jim) Jones, (DOB 1872 - DOD 1887). Shot in an ambush. May be buried in Jacksboro, TX. Could not be located on Find a Grave. 3. Henry T. Jones - killed in gunfight with Frank H. Speake near Checotah, OK. (DOB 1877 - DOD 1907). Buried in Coal Creek (Furr) (Creek Mine) Cemetery near Henryetta, OK.
4. William Tinsley Jones - husband of Mary Frances "Fannie" Murray Jones, then second wife Roma Isabel Pirkey. (DOB 1875 - DOD 1936). William Tinsley Jones and Mary Frances "Fannie" Murray Jones had a son Elzie Jones who married Evelyn (Sparks) Moncrief Jones. They had a daughter Geneva Sue Jones Owens (DOB 16 Oct 1935 - DOD 9 Mar 2012) who was married to Benny Edward Owens (DOB 5 May 1933 - DOD 7 Sep 2014). They had a daughter Susan Gayle Owens Gray and a son Ricky Dale Owens. Geneva Sue (Jones) Owens has a grandson SFC Bryce Owens. The last son of Will Jones was Raymond Loyal Jones born (DOB 25 Apr. 1934 and DOD 27 Dec. 2012). They had a daughter Grace G. Jones (DOB 1905 - DOB DOD 1907). Raymond was the last grandson of Joseph and Minnie Jones also. Will had a daughter named Mildred Pauline Jones Moore who is still alive in 2016. She helps with the family reunions. Raymond was cremated and the ashes were placed in Salem Cemetery in Dewar, OK where mother Roma Isabel Pirkey Jones is buried (Will Jones' second wife.) In total, William Tinsley Jones had 5 children with Mary Francis "Fannie" Murray Jones and 10 children with Roma Isabel Pirkey Jones. Will and Roma Pirkey Jones had a granddaughter Joy Nell Ingram Kuykendall (DOB 21 Feb 1942 - DOD 2 Feb 2016). Joy's mom Carrie Lois (Jones) Ingram was the twin sister of Carl Louis Jones. Earl David Jones (DOB 26 Aug 1954 - DOD 18 Sep 2016), grandson of William Tinsley Jones (DOB 14 Jun 1876 - DOD 19 Oct 1936) and Roma Isabel Pirkey Jones (DOB 26 Aug 1954 and DOD 18 Sep 2016). Earl's parents were Weldon Travis Jones and Beatrice Louise Jones. Their ashes were placed at Flint Ridge in Kansas, OK. Earl's brother was Charles Gregory Jones and his wife Marinita. They had a daughter Cristi Jones Holt. Earl's wife was Julie Jones (they were divorced for quite awhile) and his children were Winston Taylor Jones and Jessica Layne Jones. Earl was also cremated and his ashes were placed at Flint Ridge by family. Elzie Jones was the father of sons Billy and Bobby Jones of Henryetta, OK and Kenneth Jones. Elzie also had a daughter Geneva Sue Jones Owens. Her husband was Benny Edward Owens. Evelyn Irene Sparks Jones was the widow of John Moncrief, the son of Mattie (Jones) Moncrief. He was killed in 1931 on the railroad at Okmulgee. Elzie Henry Jones married her and raised her two kids, Monroe and Joyce Moncrief. Kenny Wayne Jones, (DOB 26 Mar 1973 Oklahoma City, OK - DOD 27 Jul 2017 Tulsa,OK) Age 44, son of Kenny D. and Linda (Pippin) Jones of Henryetta. Husband of Jennifer Moore, married Nov. 19, 2007 in Okemah, OK. Survived by 2 children: Ryan and Kenzie Jones of the home. Kenny's wife Linda Darlene (Pippin) Jones passed away December 20, 2017 at the age of 68 - DOB 16 Sep 1949. She is buried in New Sonora Cemetery in Henryetta, OK. Kenny is the grandson of Elzie Henry Jones and Evelyn Irene Sparks (Moncrief) Jones. He is great grandson of William Tinsley Jones and Mary Frances "Fannie" Murray Jones. Kenny is great great grandson of Joseph L. Jones and Mary Minnie (Smith) Jones. Funeral Aug. 1, 2017, 2:00 p.m., First Freewill Baptist Church, Weleetka, OK. Burial under the direction of Integrity Funeral Service at New Sonora Cemetery, Okmulgee County, OK.
5. Benjamin (Ben) Franklin Jones (DOB 7 Mar 1880, Jacksboro, TX - DOD 23 April 1945) - maternal grandfather - husband of Sarah Melissa (Sally) Murray Jones. Ben buried in West Lawn Cemetery, Henryetta, OK. Some time after Sally died in March of 1924 he married Bessie (DOB 1898 - DOD 1946). She is buried next to Ben. Sarah Melissa "Sally" Murray Jones (DOB 11 Feb 1884 - DOD 1924) - maternal grandmother - her mother was Mary Frances Fuller Murray and father was Andrew Jackson Murray (DOB 1854 GA - DOD 1888 Jacksboro, TX). After Mr. Murray died Mary married Frank H. Speake on Dec. 7, 1888. This is where the Speakes came into the Jones-Allen family. Sarah was buried in Coal Creek (Furr) (Creek Mine) Cemetery near Henryetta, OK. She was born in Texas. 6. Rosetta (Rosie) Jones Humphrey (we believe that is her married name) - DOB and DOD unknown. It was report she might be buried in Hichita, OK neary Henryetta, OK - Lackey Cemetery however I couldn't find her listed there. Several other close relatives were buried there. Her husband was killed. They had a son Jesse or Jess A. Jones, (DOB 17 May 1891 - DOD 21 Jan 1962) who was raised by William Tinsley Jones. Jesse (Jess A.) married Lena Mae (DOB 3 July 1904 - DOD 3 Feb 1995) and had a son Lee A. Jones (DOB 26 June 1920 - DOD 9 July 1991). Lee A. Jones married Hazel Gilstrap (DOB 11 Oct 1921 - DOD 7 May 1995). 7. Mattie Virginia Jones Moncrief Myers - (DOB 18 Feb 1882. DOD 15 Oct 1964) Jacksboro, TX. She married James Edgar Moncrief June 7, 1897. His (DOB 16 Oct. 16 1861 - DOD 29 Dec 1933). His parents were Marshall Mercer Moncrief and Elizabeth Bowles Moncrief. James Edgar's and Mattie Virginia Jones Moncrief's children were Thomas Marshal Moncrief (DOB 30 June 1898 - DOD 21 Oct 1970). William Arthur Moncrief - (DOB 21 Aug 1900 - DOD 20 June 20 1990). Lalla Pearl Moncrief - (DOB 20 Jan 1903 - DOD 31 Oct 1975). Naomi Rosezetta Moncrief - (DOB 3 Feb 1906 - DOD UK). Cordellia Elizabeth Moncrief - (DOB 27 Aug 1908 - DOD UK). Johnnie Monroe Moncrief (this is probably his gravesite--slight difference in dates from the family record) (DOB 4 Jan 1910 - DOD 13 Sep 1931). Cora Thelma Moncrief - (DOB 14 June 1913 - DOD UK). Coy Edgar Moncrief - (DOB 28 Sept. 28 1915 - DOD 1 Sep 1 1982). Savannah Georgia Moncrief - (DOB 19 July 1920 - DOD UK). Edna Virginia Moncrief - (DOB 9 Nov 1923). Margie Ailiene Moncrief - (DOB 12 April 1926). After Mr. Moncrief passed away Mattie married Mr. Myers. Martha Faye Moncrief - (DOB 18 Feb 1955 - DOD 29 Sep 2011). Daughter of Delbert H. and Mary F. Moncrief. 1. William James (Roy) Jones - (DOB June 1901 - DOD 1948) - brother of our mother - married Cecile S. Roper in 1919. Children were Harilion (Jones) Reynolds (wife's last name Reynolds), Gilbert Francis Jones (married Lois M. Curnett 10 Feb. 1945) - WWII vet in Army. Roy also had a son named Robert Jackson Jones who was shot by his brother in law in 1949 who thought he was a burglar. Roy also had a brother named Robert Jackson Jones also. 3. Netta (Nettie) Mae Jones Allen - sister of our mother. (DOB 23 June 1905 - DOD 22 July 1989). Buried in Rose Hills Memorial Park, Whittier, Los Angeles Co., CA. 4. Robert Jackson Jones - (DOB 30 June 1908 - DOD 20 Aug 1960) Buried in Tulocay Cemetery Napa, CA - brother of our mother - married Cecile S. Roper Jones. 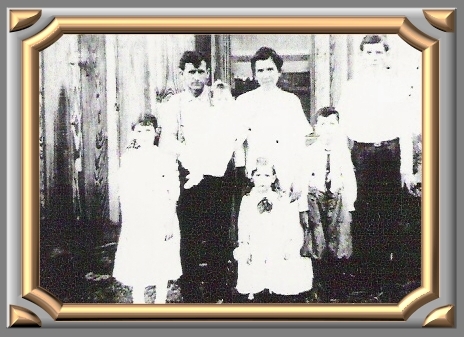 Children were Betty Inez Jones, Buford Jones, Lewis Emerson Jones (wife is Maria Sylvia Santos), and Yvonne April Jones. Buried in Tulocay Cemetery, Napa, CA. Learn more about Robert from clicking on the link listing his name at the first of this paragraph. His obituary is on this page and a picture of his marker. 5. Alvie Franklin Jones - (DOB 9 June 1912 - DOD 27 May 1974) - brother of our mother - married Helen Arlene Kephart Anderson Aug. 5, 1942 - later divorced. Had children Harley Jones (DOB 22 May 1943 - DOD 27 May 1998), Charles Benjamin Jones (DOB 26 Aug 1944 -DOD 15 August 15 2014), Patricia Joann Jones DOB 45 Nov 1945 - DOD 23 July 2015, Kenneth Lee Roy Jones (DOB 24 June 1947 - DOD 12 April 1998), Grayce Ellen Jones Holmes (DOB 27 Oct 1948 - ), and Michael Dean Jones (DOB 24 Aug 1950 - DOD 23 May 2005). Alvie Franklin Jones and sons Harley Jones, Charles Benjamin Jones, Kenneth "Kenny" Lee Roy Jones, and Michael Dean Jones are all buried at the Chapel of the Chimes Memorial Park, Hayward, CA. Alvie Franklin Jones' grandson, son of Patricia "Pat" Joann Jones and Kenneth A. Lewis, was Shane Allen Lewis (DOB 14 June 1973 - DOD 1 Apr 2001) He was buried in Waterloo Memorial Park Cemetery in Waterloo, Iowa. His father was Kenny Lewis. Pat's other children are James Edward O'Donnell, Anthony Franklin O'Donnel, Sheri Arlene O'Donnel, and Jason Eric Lewis. 6. Ourrine Jones - twin sister of our mother. (DOB 2 Aug 1915 - DOD 1916). Buried in Coal Creek (Furr) (Creek Mine) Cemetery near Henryetta, OK.
7. Norine Jones Allen - our mother. (DOB 2 Aug 1915 - DOD 7 Jul 1944). Buried in Inglewood Park Cemetery, Inglewood, Los Angeles Co., CA. Norine was married to Joseph (Joe) Earn Allen - father - children were Carmon Lee Allen, Arnold Ray Allen, Joyce Francis Allen Harber (deceased), and Clyde Edward Allen (deceased). 8. Eligha "Don" Jones - (DOB 17 Sep 17 1918 - DOD 24 July 1999) brother of our mother - had son Don Burgess Jones DOB 29 Aug 1941. Buried in Rose Hills Memorial Park, Whittier, Los Angeles Co., CA. Wife was Norma Emma Hagen Jones (DOB 31 May 1924 - DOD 27 Oct 2013). 9. Goldie Virginia (Jones) Heckethorne - sister of our mother - wife of Mark Heckethorne - children were/are Dean Heckethorne, Kathryn "Kathy" (Heckethorne) DaBraeo, Dorothy (Heckethorne) Arnold, and Henry Heckethorne. (DOB 6 Sep 1922 - DOD 4 Mar 1952). Goldie buried in Inglewood Park Cemetery, Inglewood, Los Angeles Co., CA. She is buried fairly close to her sister Norine (Jones) Allen. 10. Ada (Ida) Pearl Jones - (DOB 22 Mar. 1910 King Township, Stephens Co., OK - DOD Unknown) - died as an infant - sister of our mother. Cordellia Elizabeth "Lizzie" Jones McLeland (DOB 1865-DOD 1947) - wife of Isaac (Ike) W. McLeland (DOB 1863-DOD 1936). Inglewood Park, Inglewood, CA near L.A.
Eligha "Don" Jones - brother of our mother - (DOB, 17 Sep 1918 - DOD 24 July 1999). Don's wife was Norma Emma Hagen Jones (DOB May 31, 1924 - DOD Oct 27, 2013). Alvie Franklin Jones - (DOB 9 June 1912 - DOD 27 May 1974) - brother of our mother Norine Jones - married Helen Arlene Kephart Aug. 5, 1942 - later divorced. Franklin James Speake, son of Frank H. Speake and husband of Naomi Beatrice Allison Speake. His mother was Mary Frances Murray Fuller Speake. Franklin and Naomi had a daughter Mary Virginia Speake (DOB May 2, 1926 - DOD Mar. 12, 1934). Laura Mae Speake Colby - She was the daughter of Mary Francis Murray-Speake. Thomas (Tom) Ellis Speake - husband of Ruth Ann Tackett Speake. Son of Frank J. and Naomi Speake. Mary Susan Speake Cochran Smith mother of Sherri Deann Cochran, Elizabeth Reinken, Christopher Smith, and Jennifer Stevens. Her parents were Thomas and Ruth Speake. Mollie Ann Speake Clevenger - wife of Joe C. Clevenger - daughter of Mary Francis Murray-Speake. Her father was Frank H. Speake. Mary Frances Murray Fuller Speake - wife of Andrew Jackson Murray, then wife of Frank H. Speake - (DOB 29 Mar 1854, DOD 6 Dec 1935). Ada Druseler Murray Dorris - Husband Charlie Dorris (infant) Jessie Lee Dorris - Ada was daughter of Mary Frances Fuller Murray and Andrew Jackson Murray. Tomie Speake (infant) - son S.P. Speake and Frank H. Speake. S.P. Speake died about the same time as Tomie the infant. Carl Sherman Jones, son of Carl Louis Jones and Etta Mae Counterman Jones, (DOB 22 Jul 1945 - DOD 29 May-2011). Husband of Louise Tucker Jones. Click on this line to read a great story about Carl written by Louise his wife. Click on this line to see Louise Tucker Jones' website. She is an author and speaker. husband of Sarah Melissa (Sally) Murray Jones. Sally's (DOB 2 Feb 1884 - DOD 1924). After Sally passed away Ben married Bessie. Bessie is buried next to Ben. Her (DOB 1898 - DOD 1946). Mattie Virginia Jones Moncrief Myers - (DOB 18 Feb 1882 - DOD 15 Oct 1964). She married James Edgar Moncrief June 7, 1897. His (DOB 16 Oct 1861 - DOD 29 Dec 1933). He is buried in Highland Cemetery, Inola, OK. After Mr. Moncrief passed away she married Mr. Myers. Cpl. Wilbur "Bill" H. Parker, son of Myrtle Jones, (DOB 24 Sept 1920 - DOD 23 April 1943) - KIA WWII. John Kenneth Jones, son of William Tinsley and Roma Isabel Pirkey Jones, (DOB 31 Oct 1923 - DOD 1 Sept 1992). Carl Louis Jones, son of William Tinsley and Roma Isabel Pirkey Jones, (DOB 1 Apr 1922 - DOD 23 Sep 1995). Willard Ingram. Joy was Granddaughter of Will and Roma Pirkey Jones. Her husband is Kermit Kuykendall. Joy's Daughter is Patricia Stevens of Oklahoma City and son is Kent Kuykendall and wife Beverly of Henryetta. Funeral was at Salem Baptist Church 6 Feb 2016. Raymond Loyal Jones, (DOB 21 Aug 1934 - DOD 21 Dec 2012) son of William Tinsley Jones and Roma Isabelle Pirkey Jones. Headed east out of Dewar on Highway 266, approximately 1.5 miles turn south or right onto Arbeka Rd. The cemetery is 4 miles south on Arbeka Rd., east side of the road. Another description of directions to the cemetery: Out of Henryetta take New Lake Henryetta Road, turn east on Juniper Road about 1/2 mile and go south on Arbeka--about 1/2 mile to the cemetery. Kenny Wayne Jones, (DOB 26 Mar 1973 Oklahoma City, OK - DOD 27 Jul 2017 Tulsa,OK) Age 44, son of Kenny D. and Linda (Pippin) Jones of Henryetta. Husband of Jennifer Moore, married Nov. 19, 2007 in Okemah, OK. Survived by 2 children: Ryan and Kenzie Jones of the home. Kenny is the grandson of Elzie Henry Jones and Evelyn Irene Sparks (Moncrief) Jones. He is great grandson of William Tinsley Jones and Mary Frances "Fannie" Murray Jones. Kenny is great great grandson of Joseph L. Jones and Mary Minnie (Smith) Jones. Funeral Aug. 1, 2017, 2:00 p.m., First Freewill Baptist Church, Weleetka, OK. Burial under the direction of Integrity Funeral Service at New Sonora Cemetery, Okmulgee County, OK.
David E. McLeland, husband of Hannah E. Miller; father of Sarah Lydia McLeland Miller, Isaac "Ike" W. McLeland, Nancy Jane McLeland, Martha E. McLeland, Annie C. Retta McLeland Cave, John Reilly McLeland, Henrietta (Harietta) McLeland, Oliver Morton McLeland, and Clara McLeland. David was the son of Isaac and Jane (Galbreath) McLeland. Hannah E. Miller McLeland; wife of David E. McLeland; and mother of the children listed above. Hannah was the daughter of William and Mary Miller.